Read about import eligibility for the 2015+ 30 Series Hybrid Alphard & Vellfire. 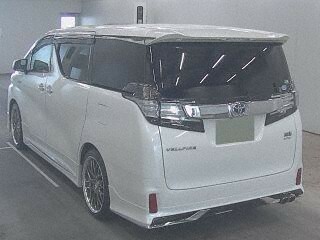 This 2017 Toyota VELLFIRE HYBRID AYH30W 2.5L 4WD ZR Edition with sunroof, Modellista package (upgraded bodykit, exhaust, suspension) and 24,652 kms was sold at HAA Kobe auction on 26 January 2019 for 4,605,000 YEN FOB. Graded 4.5 B it was in near new condition and is listed as an example of prices at that time. This should be used as a guide as prices naturally vary over time depending on condition, kms, specification level, supply, demand, exchange rates and other factors. Total price in Australia would have been approx. 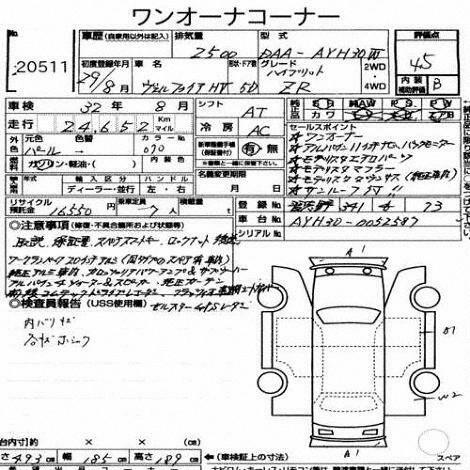 $71,500 complied plus tyres and ORC's (calculated at a rate of 77.5 Yen to the dollar). Please note that this vehicle is an EXAMPLE only and is not available for sale. It is intended to provide a good indication of prices at the date listed. We can source for import another 2017 Toyota VELLFIRE HYBRID ZR Edition to order (or order NEW direct from Toyota) so feel free to contact us to discuss the specific vehicle you are looking for and current pricing. To see what's available and research prices you can browse past and upcoming Japanese auction vehicles of any model and add yourself to our free email auction alerts trial. Vehicles shown here are examples only, and not for sale. Date, location and price are shown for each vehicle. Cost estimates include import / compliance costs as applicable, and our service fee. Market prices and currency exchange rates vary, which naturally affects final imported prices. Generally over time, recent mainstream models tend to become cheaper due to depreciation, while collector models become more expensive due to diminishing supply and greater demand. To research current market pricing for any model you can access the last 3 months of actual sales data by selecting “Date: PAST” in our Auction Search. Select “TODAY” or “FUTURE” to view available vehicles.